It is snowing, sleeting, raining, and thundering. Hello Spring! Can’t wait to put all my broken flower pots, rusty tools, and my favorite wheel barrel into my new shed. I was pretty nervous before the shed was delivered. I get very anxious when I spend money. When I put my signature on the sales receipt I almost passed out. But I’m happy now. 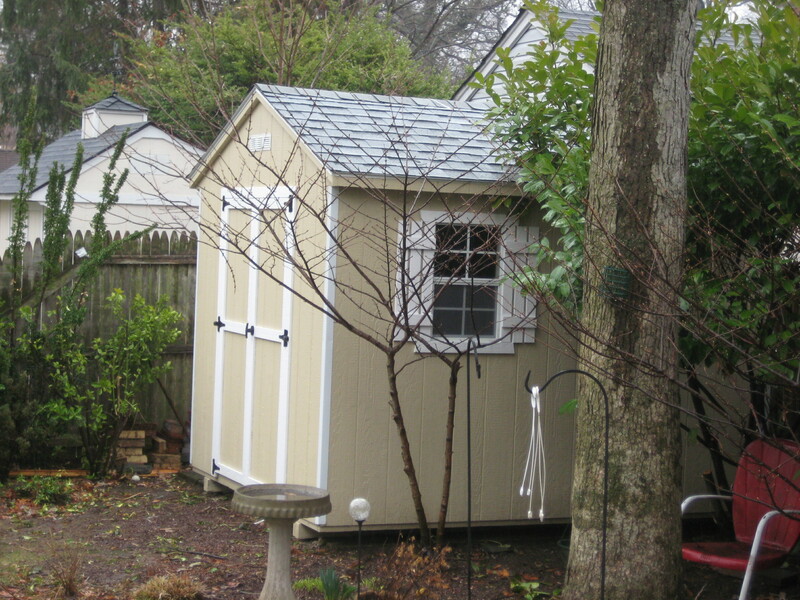 The shed was installed before the perennials broke ground. Now that the shed is here to stay I can design a nice surrounding garden. I sure do hope that those six visits to the gym paid off. Today I had an impromptu lunch with Carol. I probably shouldn’t write about this but, hey, what the hell, it’s my life and I can write what I want. She picked me up in her car. Carol doesn’t like her car. She’s been complaining about it for years and she is handing it in tonight for a VW. I give her a month of love between her and the car. But that’s not what I shouldn’t be writing about. We drove to the International Cafe in Bellmore, our usual lunch place. I sometimes order the chopped salad but I haven’t been happy with it the last few times — so, while Carol stepped away to wash her hands, I decided on a BLT on rye. She comes back, sits down and says, “Should we order the usual?” The usual is a large Belgian waffle with strawberries and whipped cream. I looked at her and must have given her a pained look because she then said, “Oh, are we getting an omelette and salad?” I was speechless. I was weak. I fell apart and said, “Absolutely, waffles. Let’s just keep it a secret,” I blurted. We ate, we babbled, we ate some more. We talked about books we read — no details — apparently neither of us are good with details. We both said lame stuff to the waitress and left her a good tip. One more time: Let’s keep this whole waffle thing a secret. If no one knows, then no weight is gained. Every year I say the same thing, “I have to get rid of this awful rusty leaky shed.” And every year I also say, “Damn, I should have ordered a shed. Now it’s too late, the perennials are popping.” Well, this year is different. I finally ordered it and I’m nervous. Did I pick the right color? Size? I’m looking over at the corner and now I’m thinking I should have ordered a smaller shed. Maybe a different color? Did I really need the window? Eh, whatever it is it will be new. Right? Did I even need another shed in that spot. Maybe a vegetable garden would have been better. Ahhh, enough! More importantly, what’s with the squirrel? Well, this morning I took a hammer and started banging on the plywood covering the crawl space. Hannah stood outside to see if a squirrel ran out in the yard. Nope, nothing. It is very quiet in my yard. I don’t see any happy playful squirrels dancing in the sun. All yesterday I was thinking of elaborate ways to tell if there is a squirrel coming in and out of the opening. Whatever it was that I thought of pretty much flew out the window when I had to crawl on the ground and stick my head under the cantilever. (Am I using this word correctly?) I could barely reach the two openings. So I took two white plastic garbage bags, crumpled them up, and shoved them up each hole. I already checked tonight and they are untouched. So far, so good. No traps out tonight. 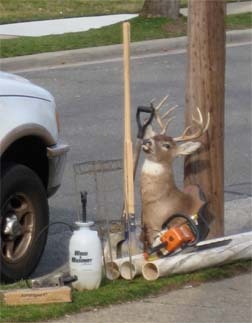 If the plastic plugs are untouched tomorrow, OMG, I think I may have stumbled on a new career — squirrel trapper. I’ve learned so much about the ways of a squirrel these past few weeks. Maybe I should calm down and take it easy. I just want this to be over. Close it up and get on with it. Tomorrow my new shed is being installed. The contractor is coming over to fix the leak by my front door and fix the air conditioning vents that the squirrels destroyed.